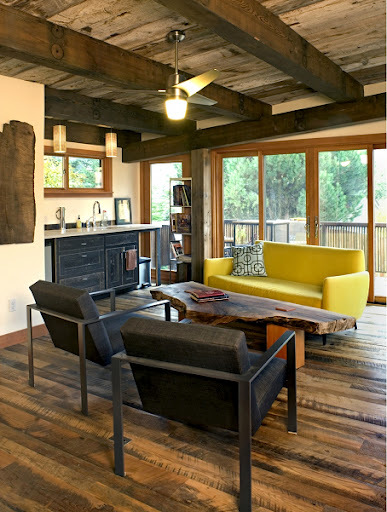 Mixed Reclaimed Wood: Soft or Hard? When Annie made the hour and a half trek to our Farmington, NY headquarters from Buffalo, NY, she was in the midst of a major kitchen overhaul in her 19th century home. She had her eye on our Grandma’s Attic Mixed Reclaimed Softwoods after viewing our website and when we chatted on the phone she decided to come out and see it for herself. Grandma’s Attic offers a very old, casual wide board look that is the result of careful selection and partial planing. Generally our attic flooring is crafted of a mosaic of hemlock, eastern white pine and Douglas fir, however other softwoods are used as available. It is a versatile option that can be left as rugged as the original planks, or smoothed out to replicate a footworn old floor. While Annie visited we were able to really discuss her project and her family’s lifestyle – kids, dogs, and home offices for both her and her husband – all revolving around the newly expanded kitchen in her historic home. We reviewed the finished sample panels and pieces of the unfinished planks in our showroom so she could really get a feel for the color and character in Grandma’s Attic. We also discussed our other options. Recently our sister company, New Energy Works Timberframers, installed a Grandma’s Attic t&g ceiling in a timber frame home. I really like how the original depth of patina, saw marks, scrapes and dings, compliment the clean lines of the heavy timbers. I’ve found the mixed softwoods have big impact whether on the floor, ceiling, wall, or even when crafted into fixtures. Annie wanted “warm” and rustic, something that looked and felt like it could have been there for a hundred years. But she also wanted something that would be durable and forgiving in a busy space. Oh, and one more thing – she wanted W-I-D-E, minimum 7″ widths. Taking all of this into consideration, I suggested the Settlers’ Plank Mixed Reclaimed Hardwoods instead of the Grandma’s Attic. While the Grandma’s Attic is a beautiful choice for a wide range of spaces, it’s also a floor that is going to show its age over time. It’s a floor that will change with its new environment just as it did in its first life so it’s great in lighter traffic areas, on walls or in spaces where the owner really wants to see and celebrate these changes. Settlers’ Plank mixed hardwoods is crafted from a variety of elm, beech, maple, hickory, ash, and other hardwood species we may have available. This grade is more relaxed, creating a barn floor look with a greater variety of color and grains due to the many species featured. It is very durable and looks great with a poly finish (as shown in this image of The Vermont Street Studio) or a more traditional tung oil. Annie finished her 7+ inch wide Settlers’ Plank Mixed Hardwoods with a natural tung oil. If her floor gets scratched, she’ll be able to “erase it” by lightly sanding the scratch then re-applying tung oil. Her project is also a great example of the flexibility of this grade – it works well in a variety of settings from historic homes (like Annie’s), to modern/contemporary designs (such as the studio below), to commercial spaces. The Settlers’ Plank flows from Annie’s kitchen through the family dining area sharing character, history, and color. I was thrilled to see the finished project – the warmth and age of the wood are a beautiful complement to Annie’s cool toned walls and white cabinetry. It’s a perfect blend of history with a modern sensibility in a family oriented space.